The artwork of the ASD 2015-2016 recipients was showcased at the National Art Gallery of the Bahamas during June! Doongalik was happy to welcome Hannah and her mum back from the States to make her annual donation to the Art Supply Drive!! 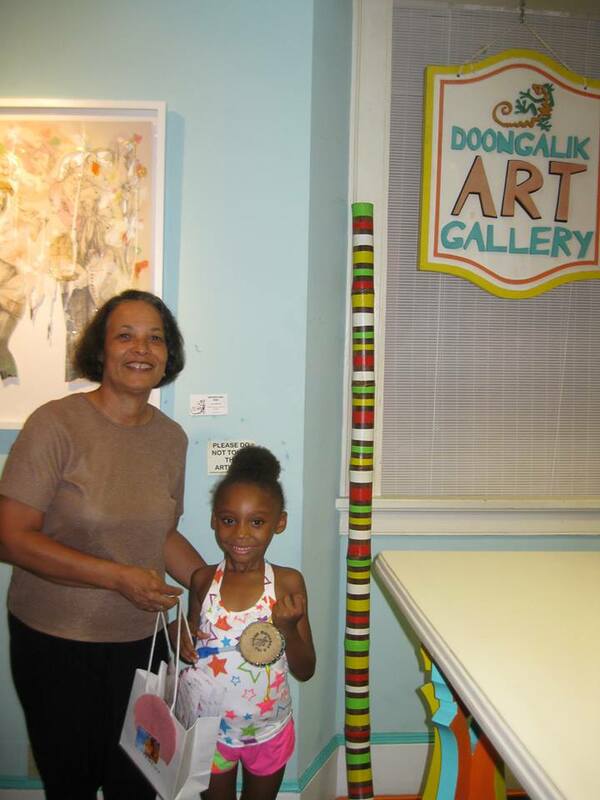 Thanks so much Hannah and the extended Symonette family for making such a positive difference to art students in need! Young and talented Hannah is an emerging author and we look forward to carrying her children's book that is presently on the presses and will be available for sale in the very near future! The next event in the ASD calendar will be the 2016 'Outside the Lines' day at Arawak Cay - stay tuned for more information on this event! The 2015 Art Supply Drive was an extended affair and included an Art Exhibition of works from last year's recipient schools in the PS Room at the National Art Gallery of The Bahamas as well as an additional fundraiser art event entitled "Outside the Lines" which took place in Pompey Square, downtown Nassau where artists and the public were invited to create artwork on plywood that was subsequently sold and proceeds donated to the ASD Fund! Three lucky schools were the 2015 recipients! 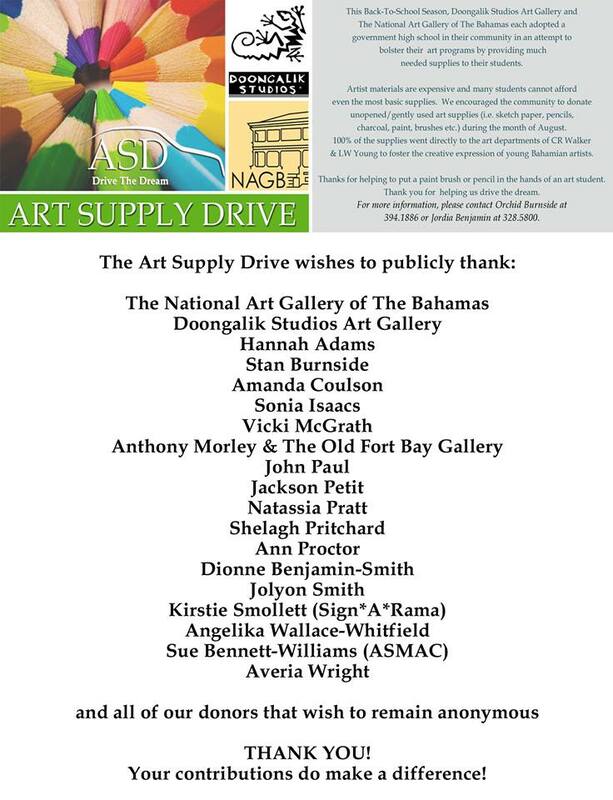 ASD thanks all of its monetary donors as well as artists who contributed art supplies, together with corporate sponsors and partner, the NAGB! Your contributions are making a hugely positive difference in the lives of many public school students! The Art Supply Drive continued in 2014 when donations increased and supplies were donated to three schools, one of which was on a Family Island! THROUGHOUT the month of August, the Doongalik Studios Art Gallery and the National Art Gallery of the Bahamas are hosting their second annual art supply drive to help students fulfill their creative dreams. Tomorrow, the NAGB will be showcasing some of the artwork done by the L W Young Junior School art programme participants who were among the recipients of last year’s supply drive. The exhibit takes place in the Project Space at 7pm. Jordia Benjamin, a former education officer at NAGB, and Orchid Burnside of the Doongalik Studios Art Gallery, started the drive last August after learning that students were unable to purchase even the most rudimentary supplies such as art pencils. The Customs rate for art supplies is currently at 45 per cent, which makes them very expensive and a low priority. “Students should at least have the tools available to them to maximise their interest and potential. We decided then to launch the drive as a very simple solution to a long ignored problem,” said Ms Burnside. The art supply drive was able to give several boxes of materials to L W Young Junior High and C R Walker Senior High last year. The schools were picked because of their locations. “We wanted to start in our own communities.” Ms Burnside told Art’s and Entertainment. After such a successful inaugural drive, she said they are anticipating similar events in the future. “I am really looking forward to hosting a annual event every August. Ultimately, our goal is to add more galleries and adopting more schools throughout the Bahamas,” she said. Before leaving the NAGB, Ms Benjamin put together a dossier of lesson plans for teachers from the schools that are not receiving donations. They are accessible via the gallery. To learn more about this programme, teachers can contact Jackson Petit at jpetit@nagb.org.bs or call at 328-5800. Donations can be dropped off at the Doongalik Studios Art Gallery as well as the NAGB during the entire month of August. A presentation of supplies will be made at the beginning of the school year. “I’d also like to mention that we will also do art pick-up,” Ms Burnside said. “If persons have a fair to large amount of supplies and it is inconvenient for them to drop the supplies at either location we will come and collect them." In August 2013, Doongalik Studios Art Gallery and The National Art Gallery of The Bahamas launched a community service initiative aimed at bridging the financial gap for art students attending government high schools in their respective areas. Recent conversations with art educators revealed that due to the high cost of materials, students are opting out of art courses or attending classes without even the most rudimentary supplies. In a country with a burgeoning art community and a wealth of talent, this deficit was begging to be addressed. With the establishment of The Art Supply Drive, the galleries intend to relieve a portion of the burden and facilitate the students' creative expression. During the Back-To-School Season, the galleries collect new or gently-used art supplies, as well as monetary donations, on site, and present them to schools throughout the archipelago. Assistant Education Officer at The National Art Gallery of The Bahamas, Jordia Benjamin, hopes that the Art Supply Drive will inspire true community participation. “With such a dearth of materials in the classroom, even a nominal contribution of an eraser or art pencil can have an impact and no supplies will be refused. Materials in high demand include pencils, sketch paper, colored pencils, erasers, charcoal, watercolors, brushes, small canvases, acrylics, clay and pastels. Of course, as a matter of convenience, we will also accept monetary donations and can purchase supplies on behalf of contributors.” 100% of the proceeds from The Art Supply Drive will go directly into the hands of young Bahamian artists at the two schools.